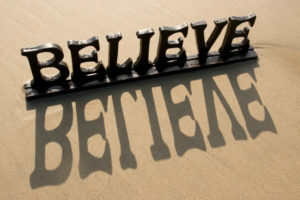 During the holiday season, there seem to be signs that say “Believe” at every turn. This became popular after the 2004 Christmas movie Polar Express and the theme song “Believe” by Josh Groban. Since then, even Macy’s department store uses “Believe” as part of their theme and advertisements. But, this saying goes back much further than that. More than 2,000 years ago, Jesus’ mother, Mary, went to visit Elizabeth, the mother of John the Baptist. At the time, Elizabeth was in her 80s and pregnant with her son. Mary was also pregnant with baby Jesus. When Mary greeted Elizabeth, the baby in Elizabeth’s womb leaped for joy. These two women who were both miraculously pregnant experienced a divine moment with their two unborn babies in their wombs! Then Elizabeth said to Mary, “Blessed is she who has believed that the Lord would fulfill His promises to her!” (Luke 1:45) The Christmas story began with the word “Believe”! Elizabeth had to believe that she could conceive her promised child in her old age with a barren womb. And Mary had to believe the angel Gabriel when he told her that she would have a Child by the power of the Holy Spirit and that He would be the Son of God. Without faith, neither one of these two women would have been able to give birth to their promises! This Scripture would encourage me many times throughout the years as I prayed that God would bring the right man of God into my life. Years would come and go, and sometimes it was very difficult to believe and keep the faith. The holiday season would be the most difficult time of the year for many reasons. One reason was because, like most women, I wanted to have someone special in my life with whom to share this beautiful time of year. It was also difficult, because the holidays always mark the end of another year — a year that I hoped would be “the year” when my prayers would be answered and God’s promises for my life would be fulfilled. However, each year ended with a sense of disappointment without the promise coming to pass. As a result, believing and keeping the faith seemed to be the hardest thing to do at times. As Proverbs 13:12 says, “Hope deferred makes the heart sick.” Hoping and believing year after year for something that seems so out of reach has that effect on us. Longing for something we don’t have can make us very heartsick. At times, we just want to give up on hoping and believing. Zechariah 9:12 says this state is being a “prisoner of hope.” It’s a place where we’ve hoped and prayed for so long, and we know we can’t give up now. Yet, continuing to hope and believe for one minute longer seems to be the most painful and difficult thing to do. Year after year, this went on — for about 20 years. Eventually, I finally came to a place where I felt more content than I ever had before, by God’s grace. Maybe the dream died; I’m not sure. But I was thankful that it wasn’t as painful to be unmarried somehow. I still believed God had someone for me, but it wasn’t always at the very forefront of my mind. Then, suddenly, my prayers were answered, and the promise was fulfilled! Last December, a special relationship began to blossom with a widower who is also a minister. He was the kindest and most loving man I had ever met! Exactly nine months later, on September 4, 2017, we were married. Just as a woman is pregnant for nine months, as Mary and Elizabeth were, the promise was born! It’s interesting that our relationship began around the time of year that was always the hardest for me. Somehow I don’t think that was a coincidence. God is so faithful and good! When going through hard times and living through unanswered prayers, the enemy of our souls would want us to become depressed and discouraged during this time of year. But, I share this story with you to encourage you: Don’t stop believing for whatever you are waiting on the Lord to do. As we enter the New Year, purpose in your heart to keep the faith and put all your hope and trust in the Lord. And in due time, He promises you will also see the best answer to your prayers … just BELIEVE! He will work all things together for your good!